Shop AMS Keyboard Accessory Value Package from AMS with 0% Interest Payment Plans and Free Shipping. The AMS Keyboard Accessory Value Package has everything you need to round off your recent keyboard or digital piano purchase. Our technicians have specifically picked items that provide the best bang for your buck we can offer. 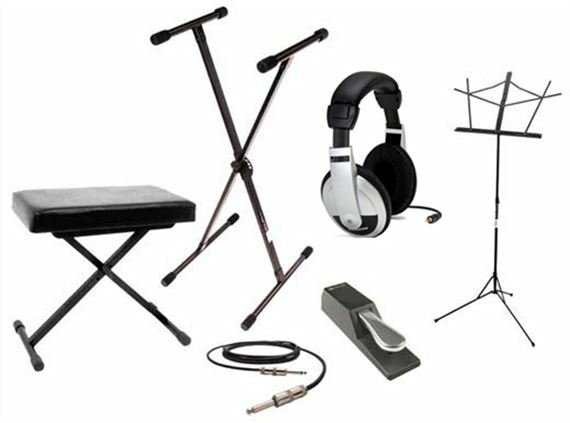 This comprehensive package includes a keyboard stand, bench, sustain pedal, folding music stand, 15' audio cable and headphones. Add one to your digital piano or keyboard order today.